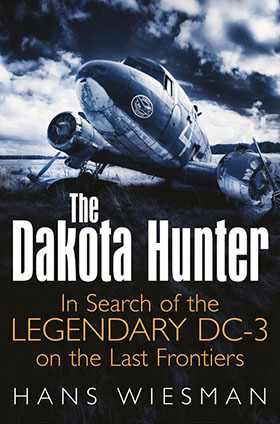 Now presented by the Dakota Hunter, a stunning new photo album with over 400 unique photographs of the PBY. 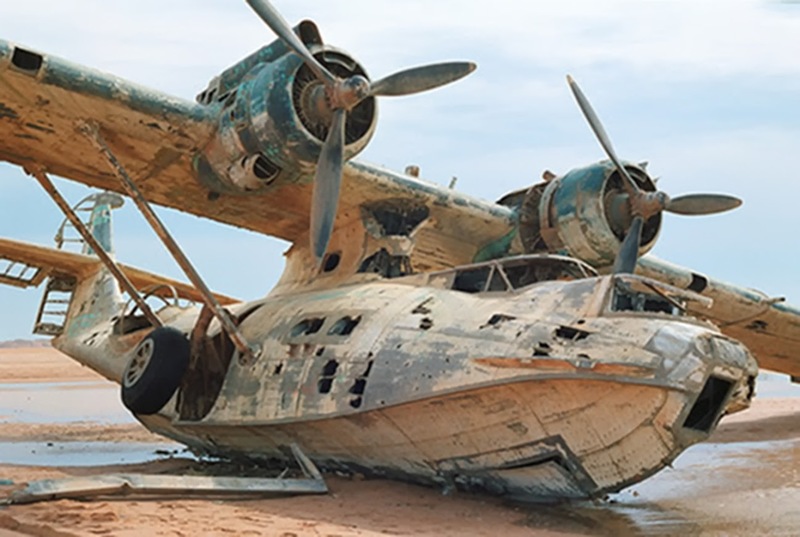 Romancing the Catalina: this book is made not only for the war-time history buffs but also for all those, dreaming of flying out one day around the world in their own air yacht, enjoying the total freedom in making a water landing in a blue lagoon or on a crystal clear lake. Also, many photos reminiscent of the “Golden Years of the Flying Boats“, with Cansos/ Catalinas being boarded by Holidaymakers/ passengers flying to exotic islands until the late 1950s, in Alaska, Canada, and Australia. You may have missed it, but this year the Consolidated PBY Catalina celebrated its 80-year anniversary. After a contract was awarded in 1935, Consolidated started building a new factory in San Diego, CA, where the first order of 60 PBY-1s went into production in 1937, now 80+ years ago. Above: Very nice and sharp photo of a couple of PBY-5s. They are all 6 Sqn, RNZAF Catalinas, and the photo was taken at Halavo Bay, Solomon Islands. The precise date is unknown but it must have been taken in 1945. (Info David Legg). Photo and caption are taken from my new book ‘80 Years, A Tribute to the PBY Catalina‘, Chapter 1: The Wartime Years. 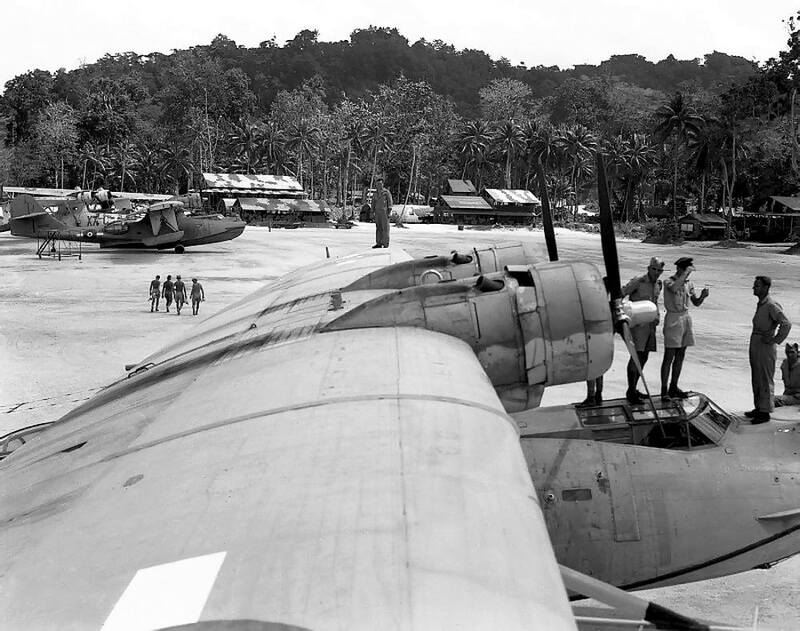 My first encounter with the iconic PBY Catalina was in Borneo, where I lived in the early 1950s as a 5-year-old boy. The huge Island (now Indonesia’s part is named Kalimantan) emerged from the Pacific War and there followed an Independence war against the Dutch colonial rulers until the end of 1949. In 1950, my father came, with his family, from the West Indies, via Holland, to the East Indies as a Shell expat and was engaged in the oil exploration and the repairs of derricks, pumps, and refineries that had been badly damaged during the war years. By 1947, Shell had decided to purchase a fleet of Catalinas for rapid supply of spare parts, food, employees, and mail to these remote places, which had no available airstrips. 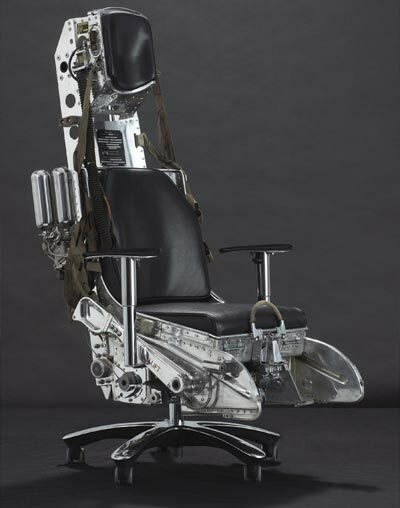 With eight Cats in operation, Shell had its own ‘FedEx’ delivery system, which worked wonders under the directorship of the legendary ex-RAF Hurricane/Spitfire ace Douglas Bader, DSO, DFC, who shot down during the war 23 enemy aircraft, despite having a prosthetic leg! 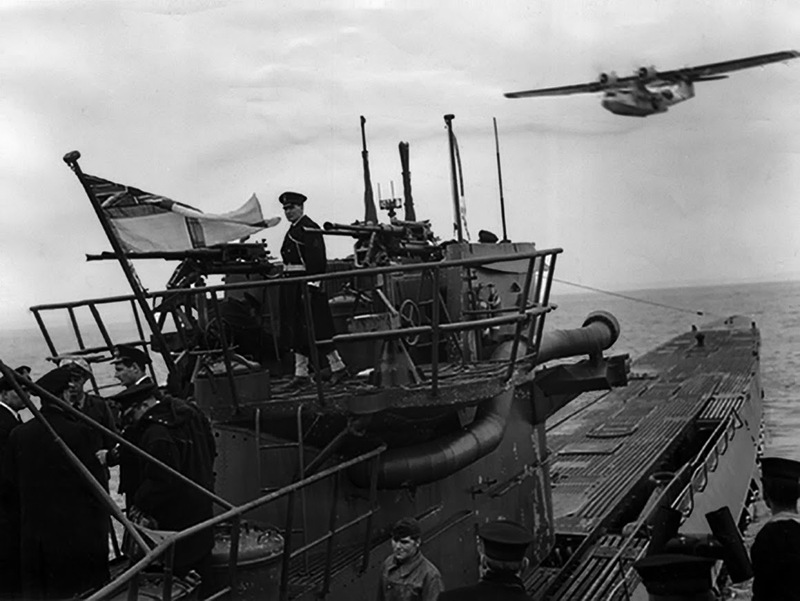 Above: Fabulous photo of RCAF Canso in a low fly pass over the U-boat U-889 that has just been taken over. A Canadian guard stands on the conning tower while the Kriegsmarine’s commanding officer made a formal surrender, and the Royal Canadian Navy flag is shown now flying. Note the big tube running on the right-hand side of the conning tower. This is the folded schnorkel mast. With this breathing device in an upright position, the sub was able to run its diesel engines for propulsion and the recharging of its batteries, while remaining submerged just under the surface of the water, out of sight of radar. But Sonar, the MAD boom, and the broken Kriegsmarine secret code were other indicators that helped the Allied hunter ships and aircraft, such as the Catalina, to detect the sub’s hidden position. Photo and caption are taken from my new book ‘80 Years, A Tribute to the PBY Catalina‘, Chapter 1, The Wartime Years, where you can find a lot more of such fascinating photos and stories about Catalinas and their outstanding performance during WW II. For an adventurous and curious kid, there was never a dull day in that Borneo jungle outpost. But every once in a while, there was a real party. This was when one of Shell’s Catalina landed on the river, almost right in front of our colonial house where we lived with our servants. 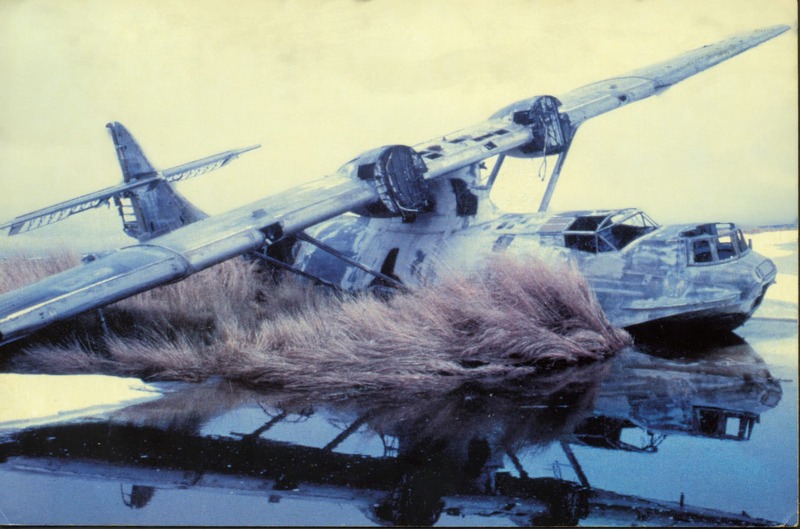 The Catalina was like a space shuttle to me, as she came in a low fly pass over the river in order to first clear the landing zone on the muddy waters of all small boats, and maybe a couple of huge crocodiles that made the riverbanks perilous grounds. She brought new guests, magazines, mail, and sweets from a faraway-Holland that I virtually only knew from photos and stories. And one day, I boarded the Catalina with my father for a flight to Balikpapan, the coastal city where Shell had its largest oil refineries and headquarters. From that moment, the Catalina must have put a spell on me that continues to this day. Above: Unsharp but fabulous photo of a Bell-47 helicopter, landing with its inflatable floats on the main wing of an Austin Airways Catalina in Canada. Was this a show-off stunt or a “daily routine”? 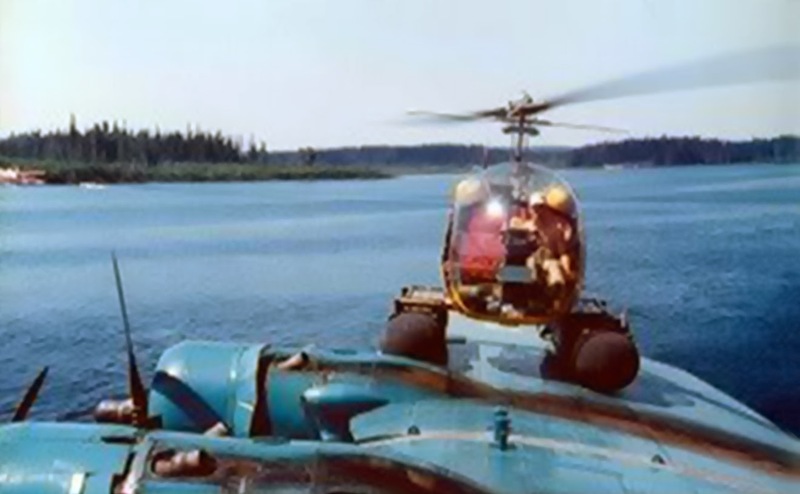 The pilot was the legendary John Schulz, according to Con Campbell (who supplied me with this photo) the best chopper pilot in all of Canada. The Bell-47 “Soap Bubble” helicopter flew with the US Army as the H-13 Sioux and earned its place in the hall of fame during the Korean War (1950–1953), then with the classic TV series M.A.S.H. with the theme song ‘Suicide is Painless’. The series, starring Alan Alda and Loretta Swift, ran on TV networks all over the world from 1972–1983 and became an ‘S’-Mash hit. The photo is from my book, Chapter 2, The Post-war Years. 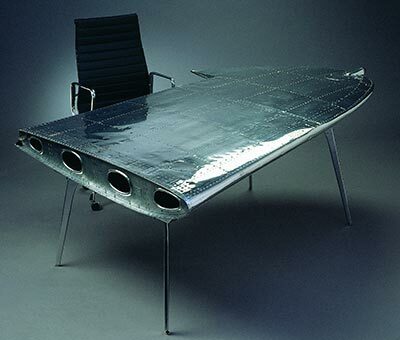 In the early 1990s, being a creative director, I was invited to join in a competition for the creation of a TV concept for a “flight-of-a-lifetime” documentary series. I pitched with the proposal to make a dream come true: A Transamerica Tour with 12 contestants, flying from Europe over the Atlantic and the Americas with – you guessed it – a PBY Catalina. I won that competition and was suddenly engaged in yet another Catalina adventure, 40 years after my first encounter with the legendary aircraft. The 250+ flight hours that I made during those trips, flying low and slow over the Americas and the Caribbean, brought me over a 1,000 stunning photographs of the two Catalina Odysseys in 1993 and 1994. Only recently, I found all photo boxes back and decided to make a photo album of the PBY as my personal tribute to this aircraft. The moment coincided with the 80-year anniversary of the aircraft and resulted in the making of a complete photo book covering the full career of the PBY from 1937 to 2017. Above: Chilean water bomber No 32, operating in Spain, where it empties its belly tanks by opening two hatches, dropping a maximum of 4,000 liters of water from its internal tanks. This was a very effective way of extinguishing a bushfire: by spraying it out from an airborne engine platform. 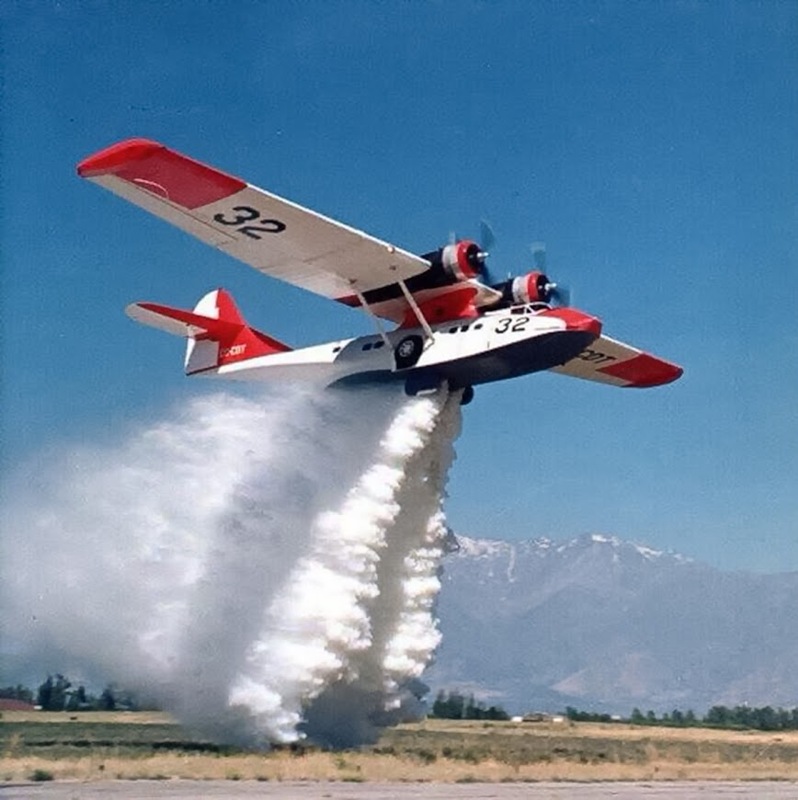 The Catalina’s flight speed of some 90 knots ensured the fine dispersion of the water over a large area, in terrain where, often, there were no roads or tracks to easily access the fires with vehicles. Freshwater loads were picked up from lakes, bays or broad rivers, allowing a rapid turnaround time. It was the PBY Catalina in this aerial firefighting role that kept the type operational in numbers for another 50 + years after the war. The photo is from my new book, Chapter 2, The Post-war Years. In my search for new photos, hidden in forgotten family albums, I made widespread “Wanted” calls on social media via my “Dakota Hunter” blogs and network. The results will impress you: fascinating stories and photos emerged from the USA, Canada, Alaska, Australia, New Zealand, South Africa, the Netherlands, France, etc. and can be found in my book. In addition, I contacted all major aviation museums in the world, asking for permission to publish photos from their WWII collections or Catalinas. The total number of images supplied was so overwhelming that I opted to extend my book from the initial 150 pages and 200 photos to a new extra large format of 288 pages with over 400 photos! 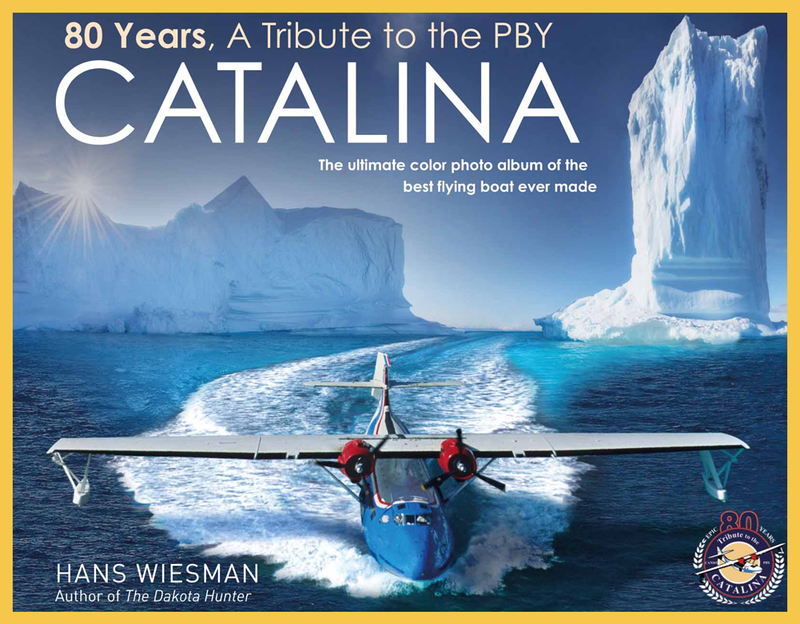 Published in hardback, this is the ultimate luxury coffee table book about the Catalina, with many photos never published before. This book is a must-have, not only for vintage aviation buffs but for all those interested in the Saga of the last great flying boat. Above; Brilliant picture of the air yacht Catalina N5593V, owned by Thomas Kendall. With his family and friends, he was on a world tour in his private Catalina and made in March 1960 a landing in the Strait of Tirana near the Saudi-Arabian beach. They were spotted by a patrol of Bedouin soldiers who took the Catalina for an Israeli spy aircraft and started an assault. 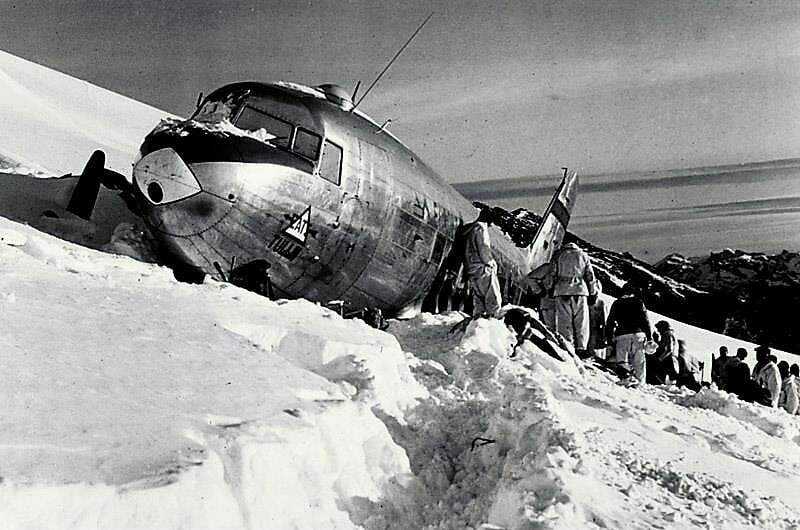 What followed was worse than a horror movie, more than 300 bullets hit the aircraft while the Kendall family had tried to get the aircraft started and fly away. There are many photos in my book from Ken Stanford, who visited the wreck in 1995. Moreover, I met Dr. Ingeborg Kendall Maranto, she was married to Bob, the son of Thomas Kendall and told me the total story what happened out there. Not discouraged by this harrowing experience, Bob and Inge made another Catalina trip in 1966 to the Pacific Islands in a scientific research project named the ‘Line Islands Experiment’. They flew to Fanning, Christmas Islands, Palmyra, and Hawaii with another Catalina N5590V. After that epic flight, their Catalina was donated to the San Diego Air & Space Museum where it is now on static display, depicted in my chapter 5, The Survivors. See the fascinating Kendall Family photos (never published before) and read Inge’s intriguing stories in my book. Chapter 3, the Special Stories. A very special offer for my Friends/ Followers and Customers. Now, you’ll have the opportunity to order your copy of the First Edition of my book. which will be available at a special introductory price. The book is printed in the USA and your order will be shipped from Dexter, MI. (regular retail price is US$ 49.95). Plus a First Day Cover Page that comes as an inlay with the book, autographed by the author. The book’s front cover is depicted above. Plane Sailing’s Air Displays Ltd from Duxford, Cambridge, UK, was the owner of this Catalina VR-BPS, which we used during the second Transamerica tour of the Catalina Odyssey in the summer of 1994.